Winding into the last days of summer, there is a lot of beautiful late summer color to soak up. Round here, there are still remnants of black-eyed susans and purple coneflower, as well as the start of goldenrod and New England aster. And we can’t forget the beach, there is still time left to get back to the beach! Needless to say, I’d like the transition to fall to be sloowwww. And you probably agree if you are heading into the fall yourself. 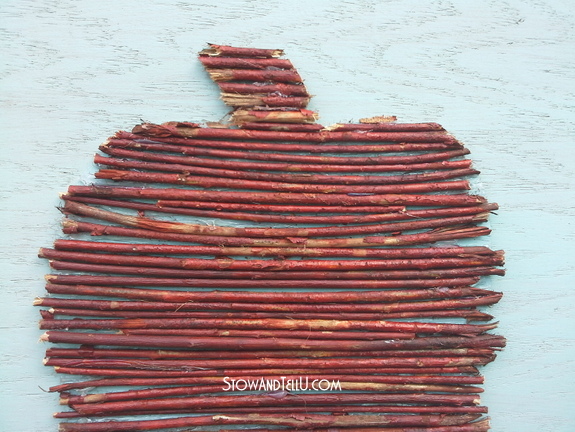 If I’m in for a penny, I’m in for a pound with the diy twig projects, so I diy’d a twig pumpkin with some touches of late summer color in mind. 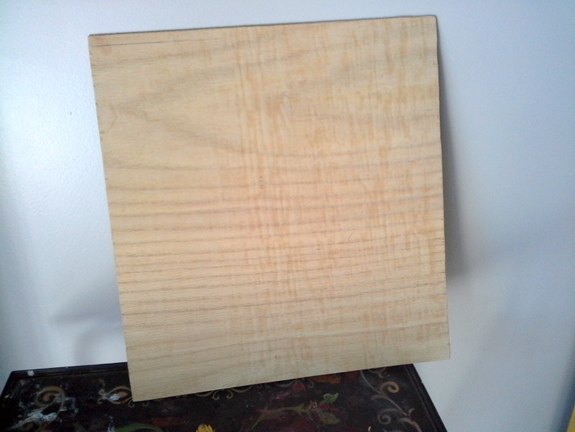 I started with this old scrap piece of wood that was a makeshift shelf from an antique armoire that I sold a while back. The new owner didn’t have need for the shelving piece, hence I kept it. 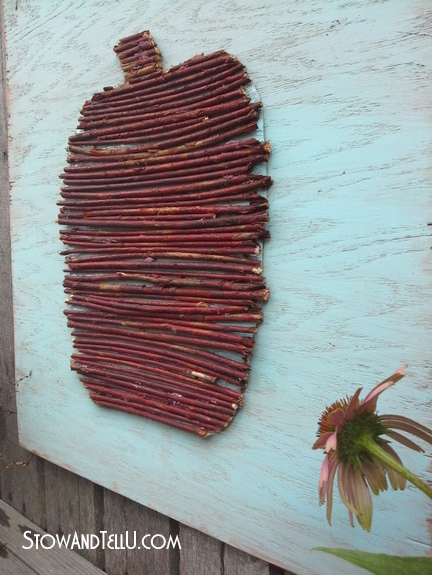 I purchased this bundle of Asian Willow branches from Michael’s and cut off the larger pieces at the bottom for my twigs. 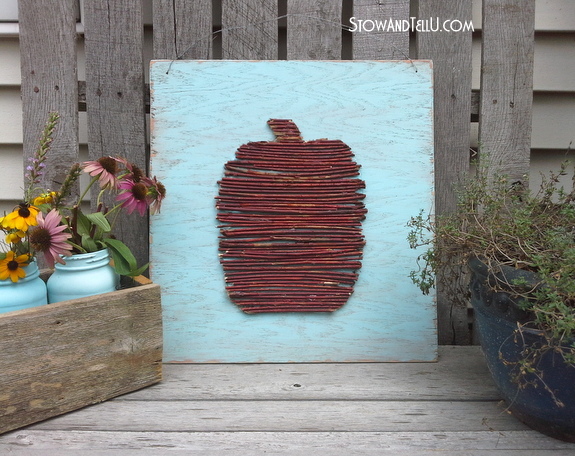 I gave the scrap wood a paint wash with a mix of orange and brown craft paint. 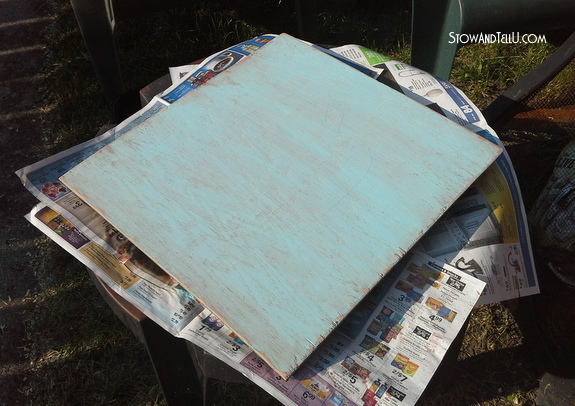 Then I gave the wood a coat of aqua-ish colored diy chalk paint; let it dry and then sanded it down a bit. 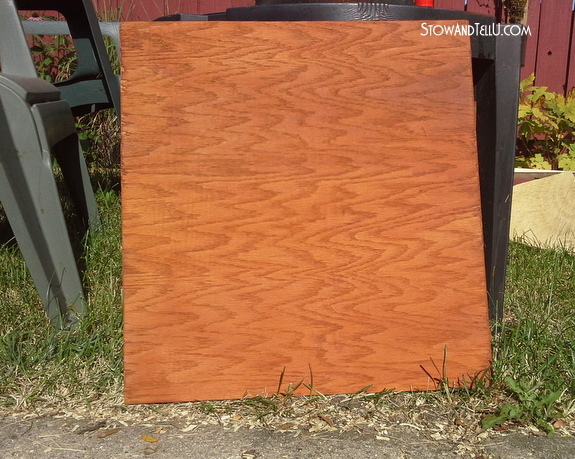 Next I googled pumpkin drawings and made a paper pumpkin template that was just the right size for the piece of scrap wood. I drew the shape and then traced around it a few times to enlarge it to size. 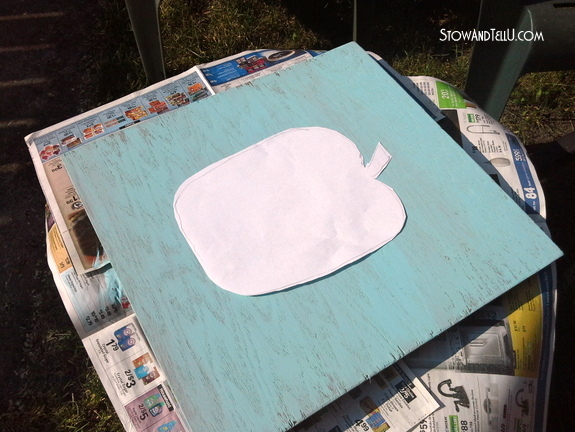 I traced the pumpkin template onto a piece of cardboard and then painted the cardboard the same aqua-ish color. 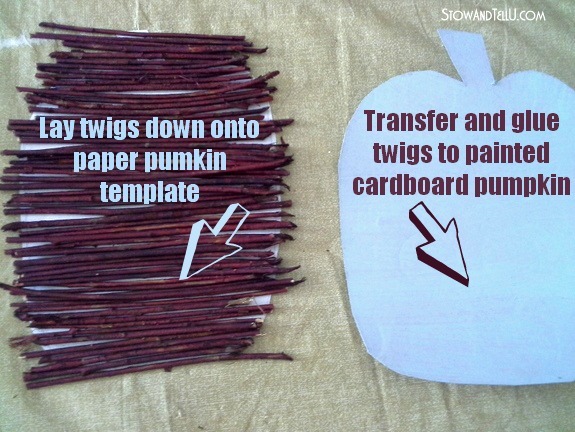 I laid my twigs out onto the paper pumpkin template and then transferred and glued the twigs to the cardboard pumpkin template. 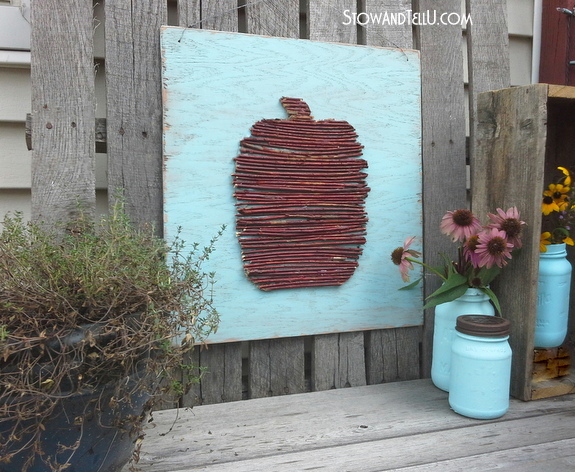 Tip: I started gluing in the middle first, and the worked my way upwards and downwards to keep the twigs straight. 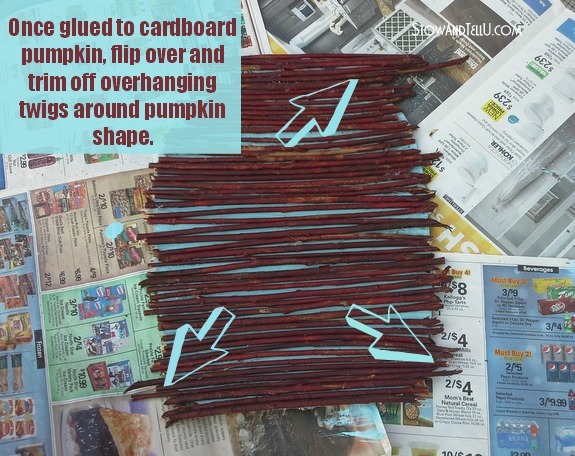 I flipped the cardboard over and cut the twigs down along the cardboard pumpkin shape. Some of the twigs fell off, so I had to re-glue them. 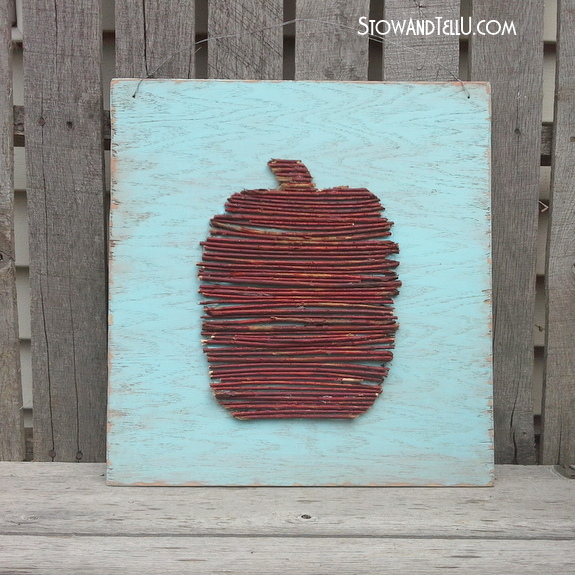 Once that was done, I glued the cardboard pumpkin, now with twigs, onto the painted scrap wood piece. I also drilled two holes and ran wire through the top part. The dark reddish, rusty orange color of the branches reminds me of the darker hues that start to show in nature during late summer. The aqua/turquoise color keeps in mind those late summer days at the beach. The pumpkin shape is a promise of the harvest, yet to come. 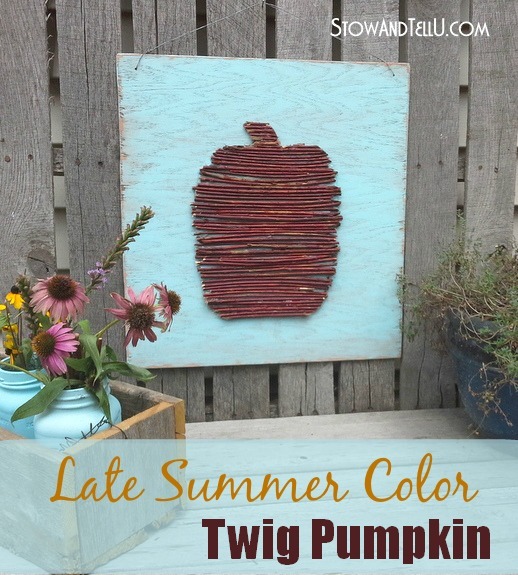 Would you call this late summer decor, or just another way of prolonging the arrival of fall? What a cute project! Love the colours together too. Oh you know I love pumpkins! I love that color too! 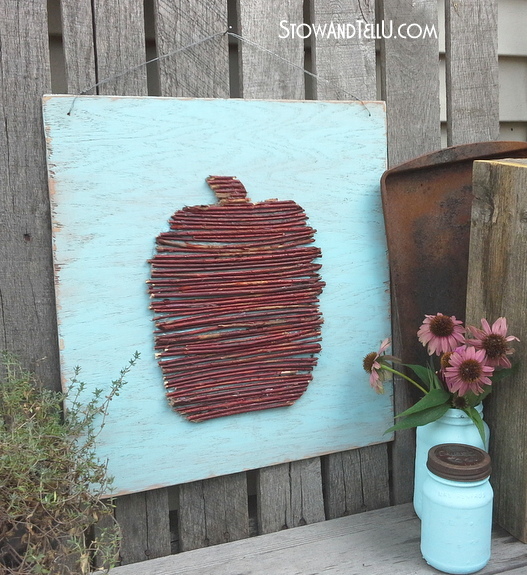 Beautiful project and way to salvage that piece of wood and make it gorgeous! This is so cute!! Pinning cuz we loves dem pumpkins!! So simple and cute!! 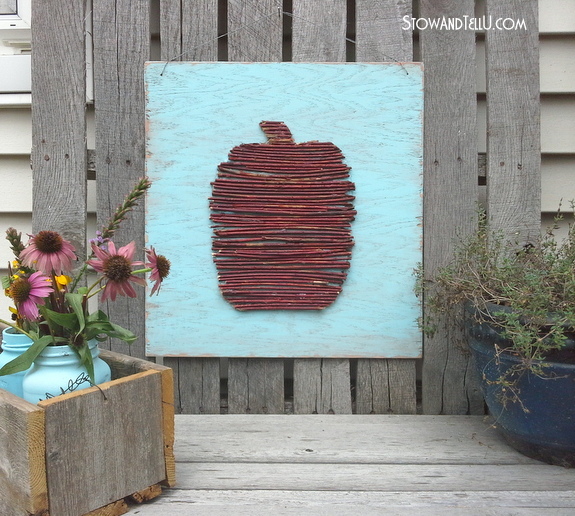 Thanks for sharing on DIY Sunday Showcase, I pinned this to our talent board! Thank you so much for pinning, Shelley. So glad you like it and DIY Sunday Showcase rocks!! I think this is the cutest thing! I love how you can’t see the cardboard! I also love the colors you chose. The orangey-brown underneath and the aqua on top. LOVE IT! I thought the card board would stand out more, too, but cool that it didn’t. I just wasn’t ready to go full-on fall colors, yet! Thanks, Miss Heather!! Great project Amy! I’m so behind in blog land! I just followed by email, hopefully I can keep up with you better! Happy Friday!